Whether you’re actively learning French or just love the sound of the language (ooh la la, who doesn’t?) it’s easy to practice your French when you dine out, because there are so many French restaurants in Sydney. From ordering meals to speaking about the city, there are plenty of easy French phrases you can use to enhance your confidence and get comfortable using French in a restaurant setting. Most French restaurants in Sydney employ French staff – so it’s not difficult to find a friendly Frenchie to practice with. You’ve probably noticed that we have a lot of French staff at our Four Frogs Mosman, Four Frogs Circular Quay and Four Frogs Randwick restaurants. We love speaking French in our restaurants and we also like to listen to our customers speak French, too. 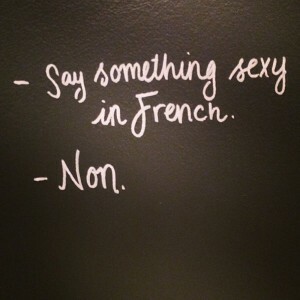 So don’t be shy – parlez Francais avec nous! If you need some inspiration, here are some simple French phrases for you to try out next time you come to eat at one of our creperies. Avez-vous une table pour deux? Can I have a glass of red wine? Puis-je avoir un verre de vin rouge? How long will you stay in Sydney? Combien de temps allez-vous rester à Sydney? Do you prefer Sydney or Paris? Quel est votre crêpe préférée?